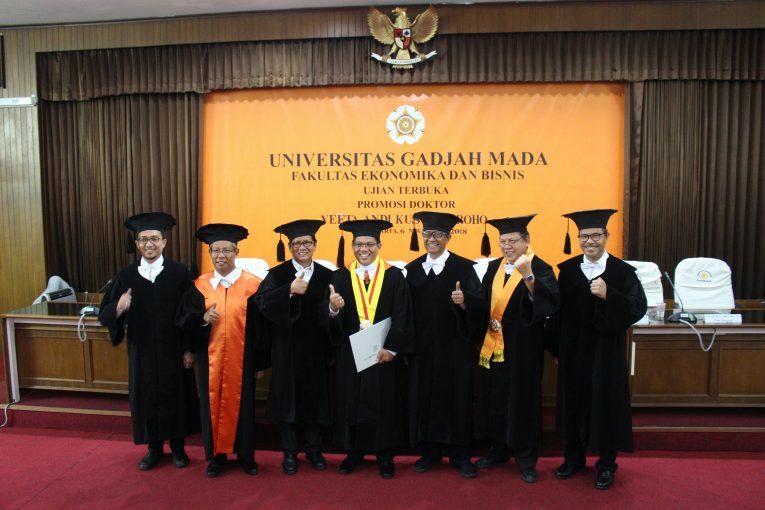 Yogyakarta – Tuesday, November 6th, 2018 The Master of Science and Doctorate Program, Faculty of Economics and Business, Universitas Gadjah Mada (MD FEB-UGM) organized a public defense doctoral promotion on behalf of Yefta Andi Kus Noegroho, who is a student of the Accounting Doctoral Program at FEB UGM. Dr. Yefta Andi Kus Noegroho, M.Si is a Lecturer at the Faculty of Economics at Satya Wacana Christian University, Salatiga. Dr. Dissertation Yefta Andi Kus Noegroho, M.Si entitled “Moral and Professional Skepticism Auditors” successfully delivered Dr. Yefta Andi Kus Noegroho, M.Si won a doctorate with a Very Satisfying predicate. The promoter team consisted of Prof. Bambang Riyanto, L.S., M.B.A., Ph.D. as a promoter, Supriyadi, M.Sc., Ph.D. and Eko Suwardi, M.Sc., Ph.D. as co-promoters. The chairman of the examiner team is Amirullah Setya Hardi, Ph.D., and members of the examining team Prof. Jogiyanto Hartono M., Ph.D., Dr. Efraim Ferdinan Giri, M.Sc., Ak., CA. and Prof. Dr. RA Supriyono, S.U. In general, Dr. Yefta Andi Kus Noegroho, M.Sc concluded that good persistence formed through ethical awareness and cognitive style within auditors had a significant contribution in realizing the auditor’s professional skepticism. Ethical awareness and cognitive style contribute to the confidence in auditors that they are moral agents who seek the right things to materialize in society. His advice is that the Managers of the Public Accountant Office should be able to separate functions including their HR. The purpose of enforcing values in the audit should be separated from the business functions carried out by the audit organization.